If your seat is reclined while your car is moving your seat belt may not restrain properly - and you could slide under your seatbelt during a head-on collision? 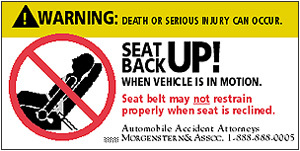 For 10 cents or less automobile manufacturers could produce a warning sticker to be placed on your visor or dashboard as a reminder to keep your SEATBACK UP! while your car is moving? Prashant Kumar suffered terrible injuries while a passenger in a Toyota car. He had no idea that when his seat was reclined while the car was moving his seat belt might not restrain properly. Tragically, Prashant slid forward under his belt during a head-on collision and lost both his legs. He was 26 years old. At the trial Toyota admitted that it knew of the danger, but insisted that a warning buried in the Owner's Manual was enough. We disagreed; so did the jury. They awarded Prashant $59.7 million. Expert witnesses told the jury that a simple warning sticker would have cost Toyota less than 10 cents each and would have alerted Prashant to the danger. After the trial Prashant pleaded with Toyota to put a warning sticker on all of its new cars - he even offered to give back ½ of the verdict if Toyota agreed. But Toyota rejected Prashant's offer by appealing the verdict - and continues to argue that its Owner's Manual warning is enough. During our long trips, chances are that one of us will be driving while the other sleeps or rests. Be careful: if your seatback is reclined, you are in danger. Toyota might not be willing to highlight this danger to you - but we are. We have decided to notify as many people as possible. We strongly encourage you to tell your friends about this hazard. call toll-free, 1-888-888-0005 or e-mail us.